Translated from Grundgesetze der Arithmetik (1893). “Frege’s philosophic career began with his intensive study of the foundations of arithmetic. In the course of his research, he developed a complex of logical beliefs and analytic methods strongly divergent from those of his predecessors and contemporaries. He was driven to philosophical reflection because of his discontent with the theoretical foundations of arithmetic. The mathematicians of his day were more intent on developing techniques and proliferating theorems than with disclosing the underlying conceptual structure of their science. 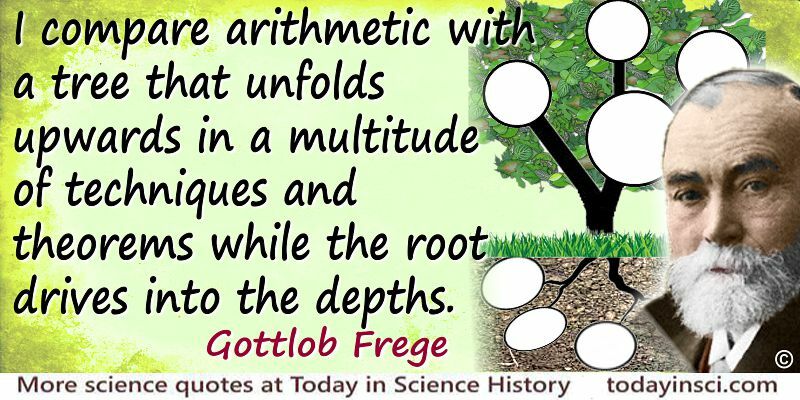 Science Quotes by Gottlob Frege.